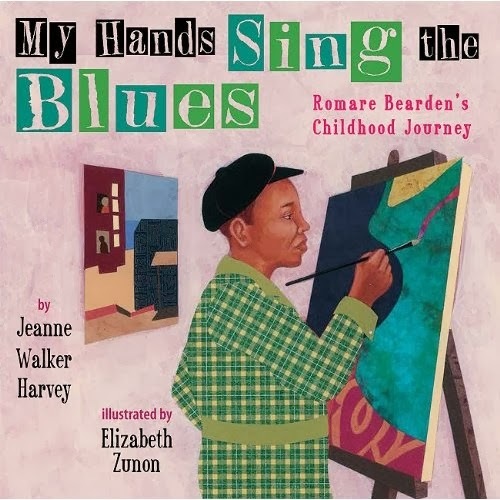 Elizabeth Zunon is an artist who has illustrated a number of books for children, including The Boy Who Harnessed the Wind, a 2013 Children's Africana Book Award winner; My Hands Sing the Blues: Romare Bearden's Childhood Journey; and A President from Hawaii. 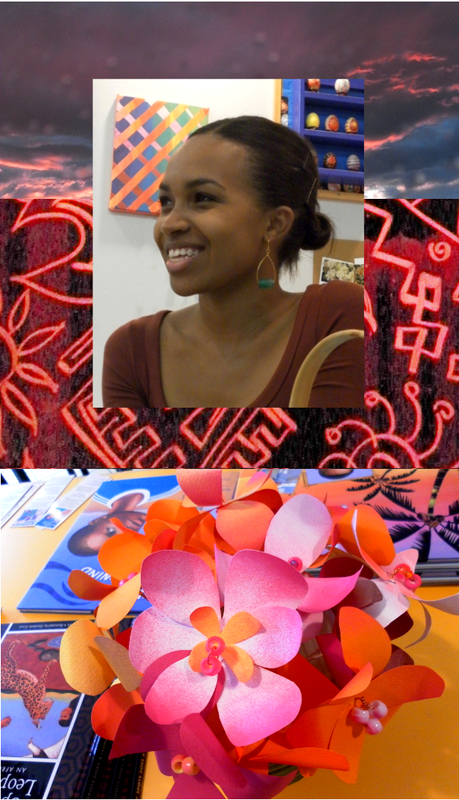 She grew up in the Ivory Coast and is based in Albany, N.Y.
Q: On your website, you mention the influence on your artwork of your childhood in the Ivory Coast. How is that reflected? A: Mostly in the bright colors I use. The everyday clothing of people in the Ivory Coast and all over Africa has bright patterning—you don’t see that here in Upstate New York! I love collecting patterned papers and fabrics. Q: How did you end up illustrating The Boy Who Harnessed the Wind, and how closely did you work with the authors? A: I was the last piece of the puzzle for that book—it was originally going to be illustrated by somebody else who had to drop out. I did not work extremely closely with the authors. I received reference images from Bryan Mealer, William Kamkwamba’s co-author; he had a lot of photographs of William with his family, in the village. I didn’t speak to William at all really until the project was done. William was off at school. Q: Do you envision your work differently depending on the age the picture book is designed for? A: I don’t really change my approach depending on the age of the child. I want to portray realistic figures, realistic landscapes and backgrounds. Q: How was it to illustrate a picture book about Romare Bearden—illustrating a picture book about an artist? A: That was a great project for me. It was my very first picture book. I was a couple of years out of college. It fell into my lap; I had lost my job at a flower shop. I had a total of nine months to work on it. That allowed me to delve into the research part; I was not very familiar with Romare Bearden’s work. I wanted to emulate the collage aspect of his work. I learned not only about the artist but his process. It helped me identify with him as an artist. The story was about him as an adult reflecting on his childhood somewhere else, and I was trying to hold onto my childhood images of the Ivory Coast; I could relate. 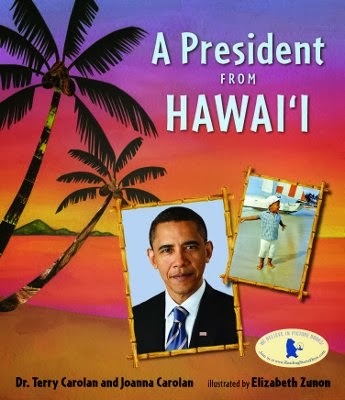 Q: What about the book about President Obama? A: That was different than the other picture books I’ve done. I only painted landscapes; they used actual Obama family photographs. It was about discovering Hawaii. I was transported back to my childhood in the Ivory Coast; [many of the flowers] are similar, and since I used to work in a flower shop, that was great. Q: Are you interested in writing a picture book to go along with your illustrations? A: I am, absolutely. I have a couple of stories in my mind. That’s my ultimate goal. Q: What do you work on with kids during your visits to schools? 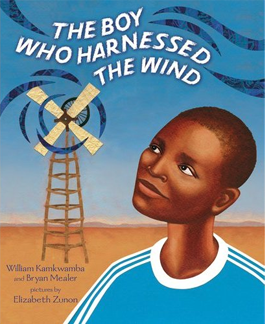 A: Sometimes the school asks me to visit because the students have read one of my books—The Boy Who Harnessed the Wind, or My Hands Sing the Blues. The kids are already familiar with it. I have a Power Point presentation about how I worked on the book. I use myself as a model, set up my camera on a timer, and work from photos of myself posing. Sometimes I’ll come into a class and we’ll work on a collage project. A: Two picture books. It’s a first for me to work on two at the same time! I’m trying to juggle both projects. One is a true story about a person in Africa, an environmental leader. The other is a fictionalized story—a girl finds poems in her grandmother’s attic written by her mother when she was growing up on Air Force bases.